Today, we will study a long prophetic period, that is, the seventy weeks, which You presented to Your prophet Daniel. Please guide us in this lesson, so that our understanding of this valuable prophecy may be appropriate, and that our confidence in Your Word may be strengthened. We have also a more sure word of prophecy; whereunto you do well that you take heed, as to a light that shines in a dark place, until the day dawn. A special blessing is promised to those who study Bible prophecy. God encourages us to invest time to understand this part of His Word. Blessed is he that reads, and they that hear the words of this prophecy, and keep those things which are written therein. In the first year of Darius the son of Ahasuerus, of the seed of the Medes, which was made king over the realm of the Chaldeans (...). The prophecy of the seventy weeks is found in chapter 9 of the book of Daniel. Before starting on the content of this prophecy, let’s look at its historical context. The events described in chapter 9 took place in 538 B.C., shortly after the conquest of the kingdom of the Chaldeans (Babylon) by the Medes and the Persians. In the first year of Darius (...), in the first year of his reign I Daniel understood by books the number of the years, whereof the word of the Lord came to Jeremiah the prophet, that He would accomplish seventy years in the desolations of Jerusalem. And I set my face to the Lord God, to seek by prayer and supplications. Studying Jeremiah’s prophecy, Daniel saw that his people would be slaves in Babylon for 70 years. These 70 years were now over, and Babylon had fallen, but the reconstruction of Jerusalem was still delayed. O my God, incline Your ear, and hear; open Your eyes, and behold our desolations, and the city which is called by Your name.» Daniel thought that the delay in beginning the reconstruction of Jerusalem was caused by the wickedness of his people. So he prayed to obtain God’s forgiveness. And while I was speaking, and praying, and confessing my sin and the sin of my people Israel, and presenting my supplication before the Lord my God for the holy mountain of my God; yes, while I was speaking in prayer, even the man Gabriel, whom I had seen in the vision at the beginning, being caused to fly swiftly, touched me. While Daniel was praying, Gabriel appeared. Thirteen years before, this angel of God had given him the vision of the 2300 days (which we will study in a future lesson), but this vision still remained unexplained. «O Daniel, I am now come forth to give you skill and understanding. At the beginning of your supplications the commandment came forth, and I am come to show you; for you are greatly beloved. Therefore understand the matter, and consider the vision.» The angel said he had come to explain the vision. But which vision? The prophet Daniel had received no vision since the beginning of chapter 9, so we must conclude that the explanation referred to his last vision, that is, the 2300 days. Seventy weeks are determined on your people and on your holy city. The Hebrew word «chathak», translated here by «determined», means literally «cut off». 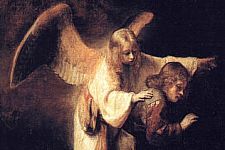 Thus Gabriel informed Daniel that a period of 70 weeks had been cut off for the people of Israel. Now, this period of 70 weeks (or 70 x 7 = 490 days) could only be cut off from a longer period, that is, the 2300 days. We will come back to this point in a moment. Know therefore and understand, that from the going forth of the commandment to restore and to build Jerusalem (...). The starting point of the prophetic period of 70 weeks is «the going forth of the commandment to restore and to build Jerusalem». When was the command given to restore and build Jerusalem? And whatever more shall be needful for the house of your God, which you shall have occasion to bestow, bestow it out of the king’s treasure house.» In the seventh year of his reign, Artaxerxes, the king of Persia, issued the decree ordering the restoration of Jerusalem. It was in 457 B.C. From the going forth of the commandment to restore and to build Jerusalem to the Messiah the Prince shall be seven weeks, and three score and two weeks. The prophecy tells us that there are «seven weeks, and three score and two weeks», for a total of 69 weeks (7 + 62 = 69), between the decree ordering the restoration of Jerusalem and the coming of the Messiah. Let’s try to understand what a period of 69 weeks means in Bible prophecy. The number of the days in which you searched the land, even forty days, each day for a year, shall you bear your iniquities, even forty years. The principle of equivalence «1 day = 1 year» («each day for a year») is recognized and applied by most Bible prophecy students. We will do the same. For I have laid on you the years of their iniquity, according to the number of the days, (...) you shall bear the iniquity of the house of Judah forty days. From the going forth of the commandment to restore and to build Jerusalem to the Messiah the Prince shall be seven weeks, and three score and two weeks. Knowing that the first 69 weeks (7 + 62), or 483 years (49 + 434), lead to A.D. 27, we must find out what happened that year concerning «Messiah the Prince». Jesus said to her, «I that speak to you am He.» The word «Messiah» (or «Messias») comes from Hebrew «Mashiach» (in Greek, «Christos»), which means «the Anointed One». The New Testament declares that Jesus is «the Messiah», «the Christ», «the Anointed One». God anointed Jesus of Nazareth with the Holy Ghost and with power. And Jesus Himself began to be about thirty years of age. Jesus was baptized at the age of 30. Then, why does prophecy tell us that this event would take place in A.D. 27? When the Christian Era was first calculated, an error of four years was made. It is obvious that Christ was not born in A.D. 1, since at His birth Herod the Great was still alive, and Herod died in 4 B.C. Therefore Jesus was born in 4 B.C., and baptized in A.D. 27, at the age of 30 (that is, since there is no year zero: -4 + 30 + 1= 27). «The time is fulfilled.» Jesus was well acquainted with Bible prophecy, and knew that the year of His baptism (autumn of the year 27) represented an important date. This is why He declared that the time was fulfilled. And He shall confirm the covenant with many for one week: and in the middle of the week He shall cause the sacrifice and the oblation to cease. Now let’s look at the seventieth week. Prophecy tells us that in the middle of this last week, «shall Messiah be cut off», causing «the sacrifice and the oblation to cease». The middle of the week means 3½ years (7 years ÷ 2). By adding these 3½ years to autumn 27, we get spring 31. What happened in the spring of A.D. 31? And He shall confirm the covenant with many for one week. The «covenant with many», which Christ had to confirm, is the covenant He sealed with His own blood by His death on the cross, for the salvation of all those who would accept His sacrifice for the remission of their sins. In the middle of the week He shall cause the sacrifice and the oblation to cease. Exactly at the predicted time, in the middle of the seventieth prophetic week, in the spring of 31, Jesus, the Messiah, died on the cross, thus bringing an end to the temple’s sacrificial system, causing «the sacrifice and the oblation to cease». This is why the veil of the temple was torn in two. And, behold, the veil of the temple was rent in two from the top to the bottom. Seventy weeks are determined on your people and on your holy city, to finish the transgression, and to make an end of sins, and to make reconciliation for iniquity, and to bring in everlasting righteousness, and to seal up the vision and prophecy, and to anoint the Most Holy. After Jesus’ death and resurrection, «making an end of sins» and «bringing in everlasting righteousness», half a week (3½ years) was still remaining before the end of the 490 years of probation set aside exclusively for the people of Israel, who had to accept Jesus as the Messiah. Thus it is written, and thus it behooved Christ to suffer, and to rise from the dead the third day: and that repentance and remission of sins should be preached in His name among all nations, beginning at Jerusalem. During the 3½ years following the ascension of Jesus to heaven, the apostles, by preaching and working miracles, invited the people of Israel to accept Jesus as the Messiah. Then they cried out with a loud voice, and stopped their ears, and ran on him with one accord, and cast him out of the city, and stoned him. Unfortunately, the Jewish nation rejected the apostles’ call. The end of the 70 weeks (490 years) was marked, in autumn of the year 34, by the stoning of Stephen, approved by the religious leaders of Israel. Stephen was the first Christian martyr killed by the hand of the Jewish nation itself. «It was necessary that the word of God should first have been spoken to you: but seeing you put it from you, and judge yourselves unworthy of everlasting life, see, we turn to the Gentiles.» With the stoning of Stephen in A.D 34, the Jewish nation conclusively rejected the gospel, putting an end to their 490 years of probation. For the overspreading of abominations he shall make it desolate, even until the consummation, and that determined shall be poured on the desolate. The prophecy of Daniel 9 ends tragically, with the announcement of the destruction of Jerusalem and its temple. Again the prediction has been rigorously accurate: in A.D. 70, the Roman army, led by Titus, destroyed the city of Jerusalem, and entirely demolished its temple. «Truly I say to you, All these things shall come on this generation. O Jerusalem, Jerusalem, you that kill the prophets, and stone them which are sent to you, how often would I have gathered your children together, even as a hen gathers her chickens under her wings, and you would not! Behold, your house is left to you desolate.» Following the pattern of the prophecy of Daniel 9, Jesus Himself made a link between Israel rejecting the Messiah, the stoning of His envoys, and the destruction of Jerusalem and its temple. At the beginning of your supplications the commandment came forth, and I am come to show you; for you are greatly beloved: therefore understand the matter, and consider the vision.» As we have seen, the period of 70 weeks aimed, among other things, to explain the vision Daniel had received before, that is, the 2300 days. Since these two visions are closely linked, and since we now understand the prophecy of the 70 weeks, we will be able to study the 2300 days in a future lesson. The prophecy of the 70 weeks didn’t aim only at satisfying the curiosity of its students. Its main goal was to announce the coming of the Messiah, our Savior and Lord Jesus Christ. We want to take this moment to renew our covenant with Your Son and our commitment to Him, by the precious blood He shed on the cross for each one of us. Please continue to guide us, as we continue to study Your Word. The test of Lesson 20 is waiting for you! Screen 1: Photo in: «Master Clips 500,000» by IMSI, CD #16, SSGP3604.JPG. Screen 2: In: «The Watchtower» magazine (June 15, 1994), Watch Tower Bible and Tract Society, p.10. Screen 3: In: «The Bible Story, volume 6» (MAXWELL, Arthur S.), p.54. Used by permission. Copyright ©1955, 1983 by Review and Herald® Publishing Association, USA. All Rights Reserved. Screen 4: STEEL, John. In: «God Cares, volume 1» (MAXWELL, C.Mervyn), Pacific Press Publishing Association, 1981, p.201. Screen 5: In: «The Bible Story, volume 5» (MAXWELL, Arthur S.), p.192. Used by permission. Copyright ©1955, 1983 by Review and Herald® Publishing Association, USA. All Rights Reserved. Screen 6: COLLINS, Fred. In: «The Bible Story, volume 6» (MAXWELL, Arthur S.), p.62. Picture edited by Cyberspace Ministry. Used by permission. Copyright ©1955, 1983 by Review and Herald® Publishing Association, USA. All Rights Reserved. Screen 7: CONVERSE, James. In: «God Cares, volume 1» (MAXWELL, C.Mervyn), Pacific Press Publishing Association, 1981, p.206. Screen 8: DROST, Willem. «The Vision of Daniel» (1650), Gemäldegalerie, Berlin. From the Web site: http://sunsite.auc.dk/cgfa/d/p-drost1.htm Screen 9: In: «The Bible Story, volume 6» (MAXWELL, Arthur S.), p.79. Used by permission. Copyright ©1955, 1983 by Review and Herald® Publishing Association, USA. All Rights Reserved. Screen 10: QUADE, Lester. In: «The Bible Story, volume 6» (MAXWELL, Arthur S.), p.68. Used by permission. Copyright ©1955, 1983 by Review and Herald® Publishing Association, USA. All Rights Reserved. Screen 11: QUADE, Lester. In: «The Bible Story, volume 7» (MAXWELL, Arthur S.), p.12. Used by permission. Copyright ©1956, 1984 by Review and Herald® Publishing Association, USA. All Rights Reserved. Screen 12: Photo In: «Master Clips 500,000» by IMSI, CD #17, C0000567.JPG. Screen 13: MANISCALCO, Joe. In: «God Cares, volume 1» (MAXWELL, C.Mervyn), Pacific Press Publishing Association, 1981, p.196. Table of Screen 13: First picture: In: «The Bible Story, volume 6» (MAXWELL, Arthur S.), p.79. Used by permission. Copyright ©1955, 1983 by Review and Herald® Publishing Association, USA. All Rights Reserved. Second picture: In: «The Bible Story, volume 6» (MAXWELL, Arthur S.), p.112. Used by permission. Copyright ©1955, 1983 by Review and Herald® Publishing Association, USA. All Rights Reserved. Third picture: STEEL, John. In: «God Cares, volume 2» (MAXWELL, C.Mervyn), Pacific Press Publishing Association, 1985, p.48. Screen 14: «Hourglass and Shadow». Photo from the Web site: www.corbis.com. Image ID: CB007962. Table of Screen 14: In: «Revue Adventiste» (October 1994), front cover. Screen 15: ANDERSON, Harry. In: «L’Espoir de l’Humanité» volume 2 (Ellen G. White), Editions Le Monde Français, front cover. Used by permission. Copyright ©1962, 1989 by Review and Herald® Publishing Association, USA. All Rights Reserved. Screen 16: COLEMAN, Ralph Pallen. In: «The Way, the Truth, and the Life», Philadelphia, The John C. Winston Company, 1958, p.67. Screen 17: Picture from the Web site: http://www.ldsyouth.com/ldsimg/johnbapt.jpg Screen 18: QUADE, Lester. In: «The Bible Story, volume 6» (MAXWELL, Arthur S.), p.69. Used by permission. Copyright ©1955, 1983 by Review and Herald® Publishing Association, USA. All Rights Reserved. Screen 19: STEEL, John. In: «God Cares, volume 1» (MAXWELL, C.Mervyn), Pacific Press Publishing Association, 1981, p.232. Screen 20: STEEL, John. In: «The Triumph of God’s Love, volume 1» (WHITE, Ellen G.), Pacific Press Publishing Association and Review and Herald Publishing Association, 1950, p. XVI. Screen 21: MANISCALCO, Joe. In: «Images from the Bible and Sacred History CD», Chosen Works, MLI Software, JM028.BMP. Screen 22: HEASLIP, William. In: «The Bible Story, volume 9» (MAXWELL, Arthur S.), p.51. Used by permission. Copyright ©1957, 1985 by Review and Herald® Publishing Association, USA. All Rights Reserved. Screen 23: In: «The Watchtower» magazine (February 15, 1998), Watch Tower Bible and Tract Society, p.15. Screen 24: DORE, Gustave. In: «La Bible de Gustave Doré», Lausanne, Edita, 1994, p.363. Screen 25: In: «The Bible Pageant, Volume 5: Warriors of the Cross» (NEFF, Merlin L.), Pacific Press Publishing Association, 1950, p.45. Screen 26: STEEL, John. In: «The Triumph of God’s Love, volume 1» (WHITE, Ellen G.), Pacific Press Publishing Association and Review and Herald Publishing Association, 1950, p.15. Screen 27: COLEMAN, Ralph Pallen. In: «The Way, the Truth, and the Life», Philadelphia, The John C. Winston Company, 1958, p.91. Screen 28: RUDEEN, Herbert. In: «The Bible Story, volume 7» (MAXWELL, Arthur S.), p.26. Used by permission. Copyright ©1956, 1984 by Review and Herald® Publishing Association, USA. All Rights Reserved. Table of Screen 28: First picture: STEEL, John. In: «Prophecy Seminars», Seminars Unlimited, 1989, Daniel lesson #31 («The cross of Christ»), p.1. Second picture: STEEL, John. In: «God Cares, volume 2» (MAXWELL, C.Mervyn), Pacific Press Publishing Association, 1985, p.28. Screen 29: Picture from: Generation of graphics on CoolText.com (http://www.cooltext.com/). Screen 30: BERRAN, Robert. In: «My Bible Friends, volume 5» (DEGERING, Etta B. ), p.45. Used by permission. Copyright ©1963, 1991 by Review and Herald® Publishing Association, USA. All Rights Reserved. Table of Screen 30: MANISCALCO, Joe. In: «God Cares, volume 1» (MAXWELL, C.Mervyn), Pacific Press Publishing Association, 1981, p.196,197. Screen 31: Photo in: «Master Clips 500,000» by IMSI, CD #16, SSGP5394.JPG.